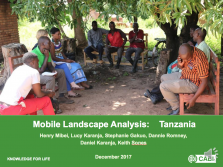 This is a presentation on the mobile landscape analysis in Tanzania put together by the UPTAKE team. It contains key findings and constraints to providing Agri VAS, lessons, opportunities and implications for knowledge organizations and is accompanied by a descriptive audio recording. The audio powerpoint was presented at a workshop titled: The use of ICT in delivering extension services in Tanzania. The workshop was held at Sea View Beach Resort, Lindi on December 5th , 2017 and was organized by the National Learning Alliance (NLA) Tanzania, Agricultural Non State Actors Forum (ANSAF) in collaboration with Naliendele Agricultural Research Institute. Supported by the Sustainable Agricultural Intensification Research and Learning in Africa (SAIRLA) programme.